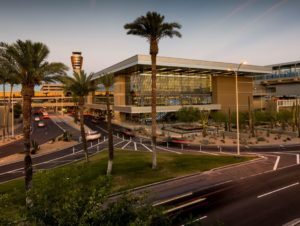 Phoenix Sky Harbor International Airport, America’s Friendliest Airport® and the largest economic engine in the state of Arizona, has a $2 billion capital improvement program underway to further meet passenger demand and enhance the traveling experience for locals and visitors alike. Like Phoenix, the airport is a vibrant growing community. In March, Phoenix Sky Harbor had the busiest month in its history with nearly 4.4 million passengers. This was 1.9 percent higher than the record previously set in March 2016. In 2017, the airport served nearly 44 million passengers. In order to meet the growing number of passengers, the airport is improving its infrastructure. 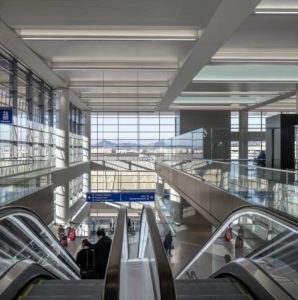 Among these improvements is the modernization of Terminal 3 to provide travelers with a more efficient experience as well as new local dining options like Joyride Tacos and The Parlor, and nationally-recognized shops. 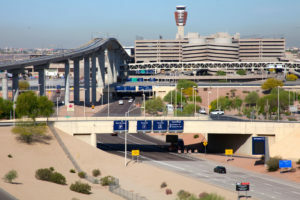 Other Airport improvements include the 2.5-mile extension of the PHX Sky Train® to the Rental Car Center, which will make it easier for visitors to travel between the terminals and the Rental Car Center, and reduce roadway congestion. Sky Harbor is also building a new eight-gate concourse to be occupied by Southwest Airlines at the airport’s busiest terminal, Terminal 4. Additionally, the airport recently concluded a retail renovation in Terminal 4 and added 37 new shops including two spas and a medical clinic. The passenger growth at Sky Harbor is a result of the strength and growth of Phoenix and its surrounding communities. A healthy economy encourages more people to travel both to and from Phoenix, and the airport serves as a hub for commercial activity and economic growth for the region. Sky Harbor’s contributions to the economy are vast. The airport has a daily economic impact of $106 million and an annual economic impact of $38 billion. On an average day, more than 120,000 passengers come through the airport, approximately 1,200 aircraft arrive and depart, and more than 800 pounds of cargo is handled. The airport provides more than 57,000 jobs for local residents, and a recent Arizona State University economic impact study showed $5.8 billion in visitor spending resulted in the creation of 67,000 hospitality and tourism jobs. Economic growth has also contributed to new air service from Phoenix. In addition to offering nonstop service to more than 100 domestic destinations, Sky Harbor also offers international service to more than 20 destinations. This year, the airport added nonstop service to Montreal, additional daily service to London on British Airways, extra flights to Calgary and Vancouver, and new seasonal non-stop service to Frankfurt, Germany aboard Condor Airlines. America’s Friendliest Airport® continues to enhance its facilities to provide world-class customer service and expand its air service options. For more information, please visit skyharbor.com.